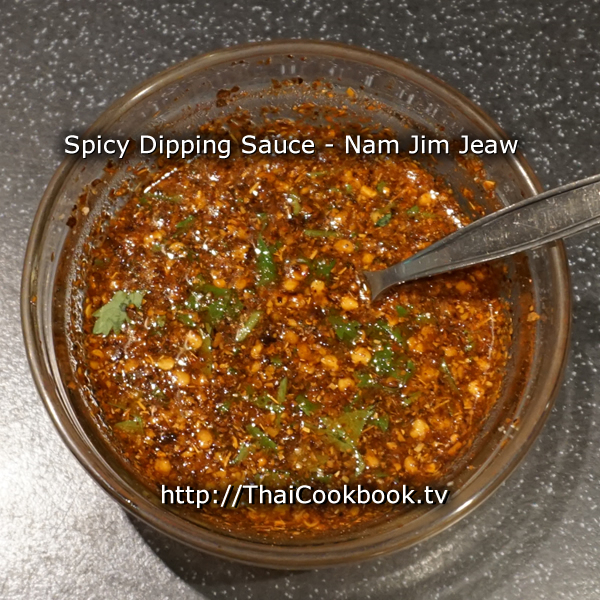 Nam Jim Jeaw is a spicy dipping sauce that we often serve with grilled meats. The main ingredients are dried hot chilies, toasted and ground rice, fish sauce, sugar, and fresh lime juice, and it is quite easy to whip some up. 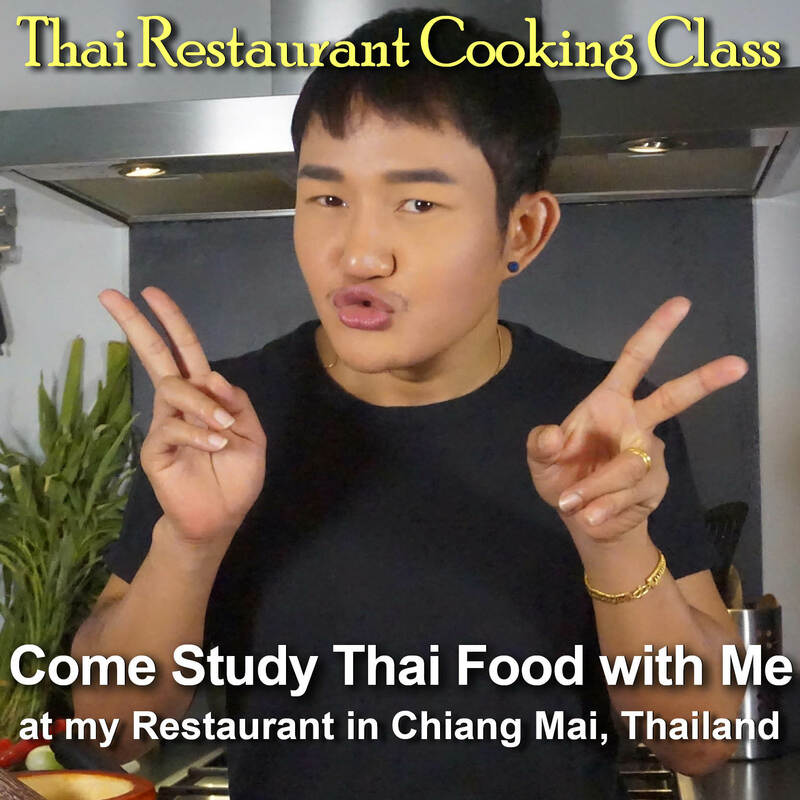 Dried chili dipping sauce is always served on the side with Gai Yang (ไก่ย่าง), our traditional recipe for barbecued chicken that is marinated in a flavorful Thai sauce and then grilled over wood coals. You can prepare this dipping sauce recipe to serve on the side with western style grilled meats. 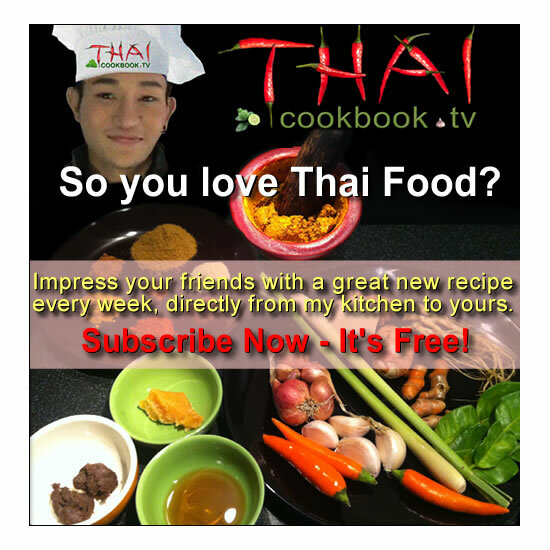 Use it to add a Thailand style fusion of flavors to beef steak. It's terrific. What's in our Dried Chilli Dipping Sauce. 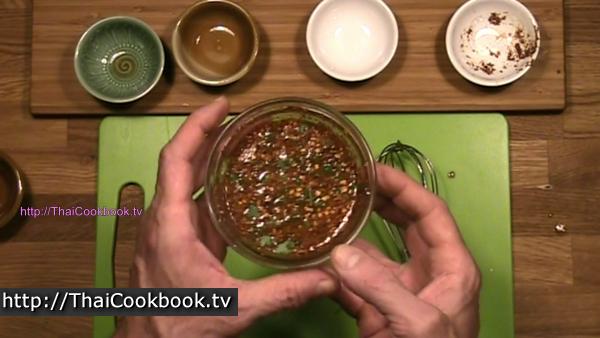 How we make our Dried Chilli Dipping Sauce. 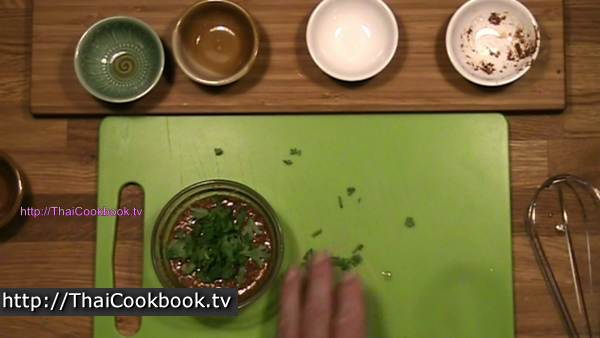 1) Combine the fish sauce, fresh lime juice, sugar, toasted ground rice, and dried chili flakes. Stir well until the sugar dissolves. 2) Add cut cilantro leaves and stir in well. 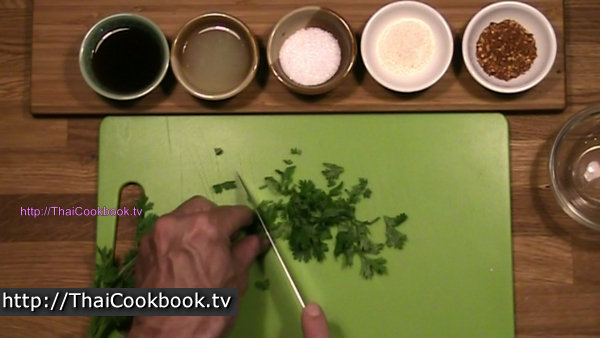 Let stand for 15 minutes before serving, then stir up well and add a few fresh cilantro leaves to the top. 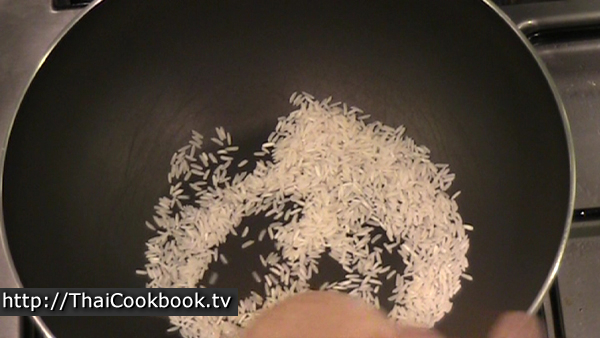 One ingredient that we need to make nam jim jeaw that you might not have on hand is the toasted and ground white rice. Some markets in Thailand have this toasted and ground rice already done and sold in small bags. If you already have the rice, you can skip to step 3. How to make your own toasted rice: Take about 1/2 cup of rice and toast it in a wok or frying pan over medium heat for about 5 - 10 minutes, stirring constantly. 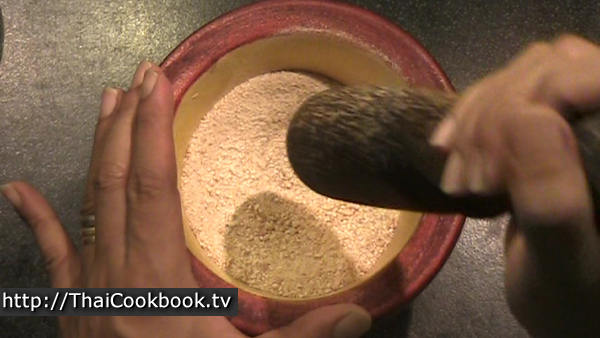 When the rice is mostly golden brown in color, let it cool then put it in a mortar and grind until it is crushed into a rough powder. You don't need every kernel crushed completely. A few big pieces will be OK. You can also do this in a small grinder, like a coffee grinder, or food processor. 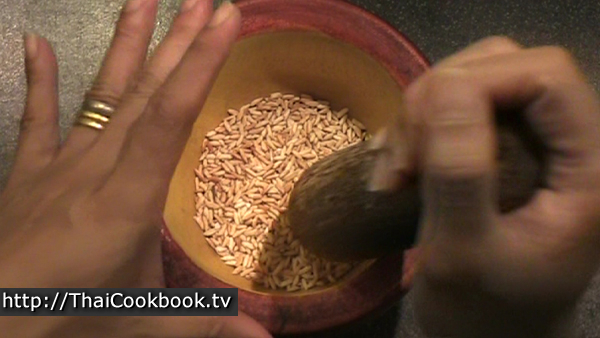 Store this ground rice in your spice rack in a tightly sealed jar. This is a lot more than you'll need right now. If making your own chili flakes, grind the while dried chilies just until they are well broken up. You don't want chili powder. Squeeze the fresh limes, and measure the other ingredients. You'll need a nice fresh bunch of cilantro. Cut the cilantro leaves into big pieces. Don't chop it too fine, as this bruises the leaves. It should be cleanly cut and pretty. 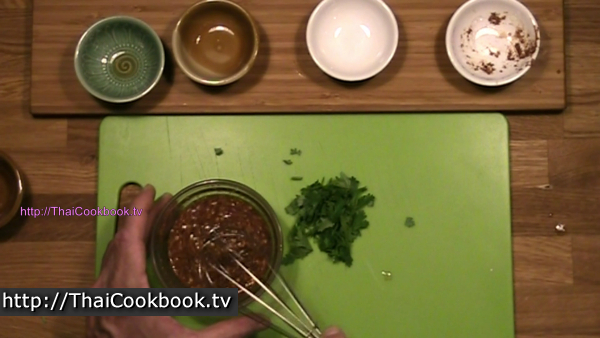 Stir together the fish sauce, lime juice, sugar, ground rice, and chili flakes. Let it sit for a minute. Keep stirring until the sugar is dissolved. Stir in the cilantro leaves and mix it all up well. Allow the dipping sauce to sit for 15 - 20 minutes before serving. 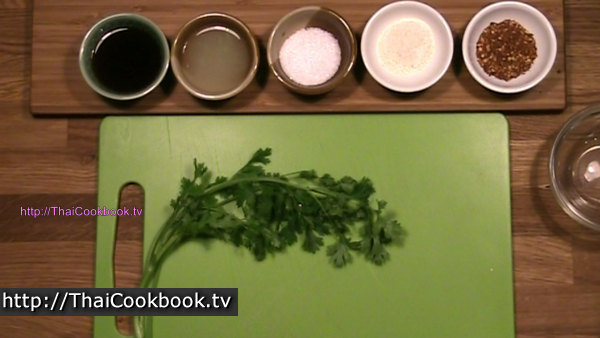 Stir well and then add a few more cilantro leaves to the top just before serving.